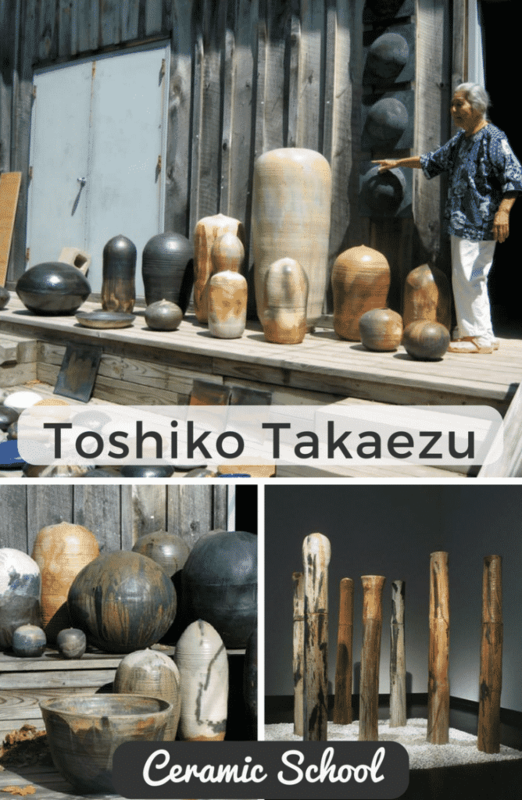 Toshiko Takaezu was born in Pepeekeo, Hawaii. She traveled to Japan, where she studied Zen Buddhism and the techniques of traditional Japanese pottery, which influenced her work. When she developed her signature “closed form” after sealing her pots, she found her identity as an artist. The ceramic forms resembled human hearts and torsos, closed cylindrical forms, and huge spheres she called “moons.” Before closing the forms, she dropped a bead of clay wrapped in paper inside, so that the pieces would rattle when moved. The most important part of her ceramic pieces is the hollow space of air within. She relates this to the idea that what’s inside a person is the most important. She retired in 1992 to become a studio artist, living and working in the Quakertown section of Franklin Township, Hunterdon County, New Jersey, about 30 miles northwest of Princeton. In addition to her studio in New Jersey, she made many of her larger sculptures at Skidmore College in Saratoga Springs, New York. She lived in Hawaii for 10 years and died March 9, 2011 in Honolulu. Don’t worry, we don’t sell or spam your email address. You can unsubscribe at any time.